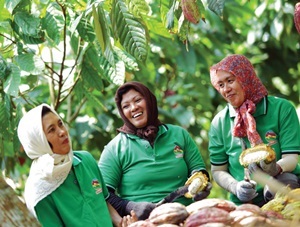 PT Perkebunan Nusantara XII – PTPN XII or PTPN 12 is a well-established plantation and agribusiness company in Indonesia, based in Surabaya East Java. PTPN 12 has 34 garden units in 80,000 hectares of plantation area throughout East Java province. PT Perkebunan Nusantara XII was established in 1996 as a merger results of 3 state plantation companies, namely ex PT Perkebunan XXIII (Persero), PT Perkebunan XXVI (Persero) and PT Perkebunan XXIX (Persero). PT Perkebunan Nusantara XII is a holding member of PT Perkebunan Nusantara III (Persero) or PTPN 3 Group, a leading state-owned agricultural holding company in Indonesia. As today, PTPN 3 Group holds 90% shares in PTPN 12 and other 10% remaining shares in PTPN 12 was owned by the Government of Indonesia. As of December 2017, PTPN 12 has 4 subsidiaries; PT Rolas Nusantara Mandiri, PT Rolas Nusantara Medika, PT Industri Gula Glenmore, and PT Rolas Nusantara Tambang. In the business year of 2017. PTPN 12 experienced a decline in financial performance. According to information found in PT Perkebunan Nusantara XII Annual Report 2017 as cited by JobsCDC.com, PTPN 12 booked total revenue of Rp 987.45 billion in 2017 or decline from total revenue in 2016 worth of Rp 1,076.44 billion. PTPN 12 recorded a total loss of Rp 58.481 billion in 2017 as compared with profit in 2016 amounted to Rp 52.57 billlion. Male/Female, maximum age of 25 years old on 1 April 2019. Minimum Bachelor Degree (S1), preferably majoring in Criminal Law, Civil Law or Agrarian Law. Willing to be placed in all working area of PTPN XII. The candidates with prior experience in the relevant field for minimum 1 year is preferred (as evidenced by working reference letter). Drug free (as evidenced by medical certificate). Never been dishonorably dismissed from a government or private legal entity. Male, maximum age of 25 years old on 1 April 2019. Minimum Diploma or Bachelor Degree (D3/S1) majoring in Geography or Geodesy. Mastering mapping software (ArcGIS and Global Mapper). Able to conduct and process the results of measuring the area coordinates using GPS. Skilled in operating GPS Geodetic and QGIS will be an advantage. Operating knowledge of DJI Phantom dron and abel to process the results will be an advantage. Able to develop web based digital mapping which can be accessed online with mapserver/arcGIS Server/Gis Server will be an advantage.